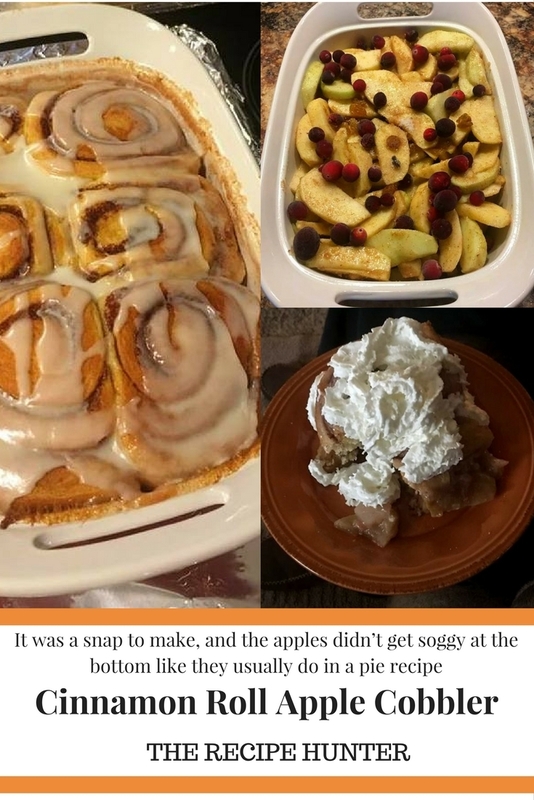 This recipe is called, “Cinnamon Roll Apple Cobbler.” It was a snap to make, and the apples didn’t get soggy at the bottom like they usually do in a pie recipe. This recipe made a healthy batch that lasted for a week in the refrigerator. 7 cups peeled, cored, and sliced apples – your choice. I used Granny Smith, Braeburn, Fuji, and Gala. Stir together sugar, flour, and ginger. Add sliced and peeled apples, raisins, cranberries, and water (if you choose to add it). Toss ingredients to combine. Spoon the apple mixture into a *2 quart round casserole dish. (I used what I had). Cover. Place a foil-lined baking sheet on the oven rack below the casserole dish. Bake, covered, 50 minutes or until the apples reach the amount of softness you desire. When the apples are done, arrange the cinnamon roll pieces on top of the apple filling. Bake, uncovered, 25 to 30 minutes. Drizzle icing from cinnamon roll package over the top. If you don’t have a two quart round casserole dish, use a two-quart square baking dish. Prepare as directed. Cover the dish with foil and bake the apples for 40 minutes. Once the apples are done, proceed with adding the cinnamon rolls and baking uncovered for 25 to 30 minutes. I chased down my husband to get a photo of his lunch. He added whipped cream!